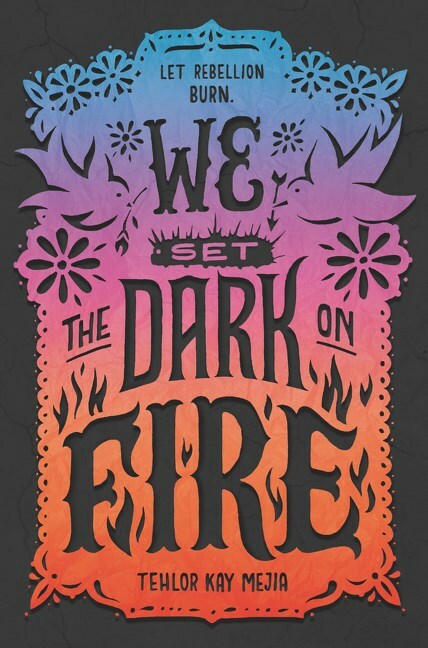 With the writing of her debut novel, We Set the Dark on Fire, Tehlor Kay Mejia set out to begin an answer to some questions: What do we lose when we are forced to subjugate our desires for our drive? How long can we keep ourselves in the cages in which society is so fond of locking us? As she chips away at the answers, she actually asks more questions, as all good research will do. The promised second book in the duology will certainly answer and ask more. This daring and romantic fantasy will likely be appreciated by fans of The Handmaid’s Tale by Margaret Atwood. Book One is framed by an ancient myth which gives background to the plot. Essentially, because of a feud and a search for subsequent harmony, marriages in upper class society are composed of one groom and two brides: a Segunda— both beautiful and brave—to nurture a man’s passions and emotions and a quick-witted and loyal Primera to nurture his logical and discerning nature. With such balanced matches, one might conclude that emotion would never cloud one’s judgment nor logic hamper one’s ability to feel. Seventeen-year-old Daniela Vargas, having trained for five years as a Primera in Medio’s School for Girls, has learned to wall off any feelings that might interfere with her restraint. Although she is unwilling to let her emotions take control, she is not eager to be married off like a piece of property to join the ranks of upper-class dolls. Besides, she is hiding a secret about her family background with forged papers about her pedigree, and if she is caught, she will be imprisoned or worse. So, out of deference for her parents’ wishes and for their safety, Dani plays the role in a world where wealth and beauty buy unearned status. With the victor undecided, both duty and desire claw at each other while her mother’s mantra plays in her head: Dani must find a way to make a life that she loves. Given this internal conflict, Dani wonders how she can find joy in a life of luxury while so many others are suffering. When she is chosen to be the bride of Mateo Garcia, a cold and condescending man with cruelty in his eyes, the chasm widens. The Garcia family is both wealthy and powerful, wielding that power to intimidate and to punish those who were born with less, destroying lives and oppressing people just because they can. The Segunda chosen to complete the trio is Carmen Santos, a beautiful and mysterious young woman who wears multiple masks to hide her motives. Her distaste for Dani at the girls’ finishing school, however, was not disguised, where she bullied Dani without mercy. Mejia’s book refers frequently to a wall that separates the fertile ground of their island home from the desolation and squalor of those left to live in poverty. Dani knows intimately what that life means, but her dusty memories tell her that it wasn’t an altogether unhappy life. Still, if someone finds out the truth about her forged papers and her having no claim to a life of luxury, Dani’s family will also suffer. So, to protect them and to survive herself, she continues the pretense. Her honorable reasons might mask sorrow and potential regret about a personally difficult and distasteful decision, but rather than being sorry, Dani decides to be useful. The wall discussion brings to mind current political conversations and contemporary life where people are “shot at the wall, deemed criminals because desperation [has] forced them to cross a border they hadn’t built or consented to” (178). Because Dani’s thoughts go out to the children who are sent back to starve for being born on the wrong side of that line, she decides to be of use. When Dani chooses the liberation of the unfairly oppressed over her own safety, she discovers how choices have the power to change a person. Although her involvement with Soto, a member of La Voz, a gang of freedom fighters, was initially uninvited, she eventually embraces the Emma Lazarus philosophy adopted by the revolutionaries: “If we’re not all free, none of us are free” (19). If nothing else, working as a spy for the resistance is dangerous, but the prize—”the upset of a power structure that prioritizes the wealthy and leaves the rest to suffer” (143)—is all the motivation Dani needs. After all, what right did she have to cloak herself in safety when she knew what it felt like to want, to need, and to be denied? Dani has a plan; she just has to hope it won’t get her killed. Although the wealthy share a narrative about privilege and destiny, Dani knows their narrative is a lie, and all the best lies have some truth in them. The real story is about greed and money and politics and privilege and prejudice: “The real story is that we live in a system that was created thousands of years ago by people who wanted to reward those like them and punish everyone else” (251). 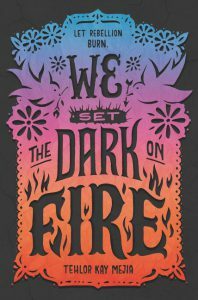 We Set the Dark on Fire is full of action and intrigue as it explores whether “people who want easy and pretty stay in their cages” (344). But freedom’s price is not such a tidy either-or. Survival and safety and the heavy expense of collateral damage certainly can give a person pause. Tagged disparity, feminism, relationships, resistance, romance, social class differences, spies. Bookmark the permalink.